I just love getting emails like this...our Franchise Partner who provide Exceptional Quakertown House Cleaning Services shared the following glowing house cleaning review. It's obvious that Terri & Holly are going beyond the call of duty because our List of Cleaning Services says nothing about weeding flower beds! Our Clients give the best house cleaning service reviews, so good job, and keep them coming. This is what You've Got Maids is all about! Holly and Terri came today and did an awesome job. They were both very professional and personable. They did a wonderful job and even went above and beyond helping us with the dishes and weeding the flower bed. Great Feedback From A Happy Quakertown-Allentown House Cleaning Customer! 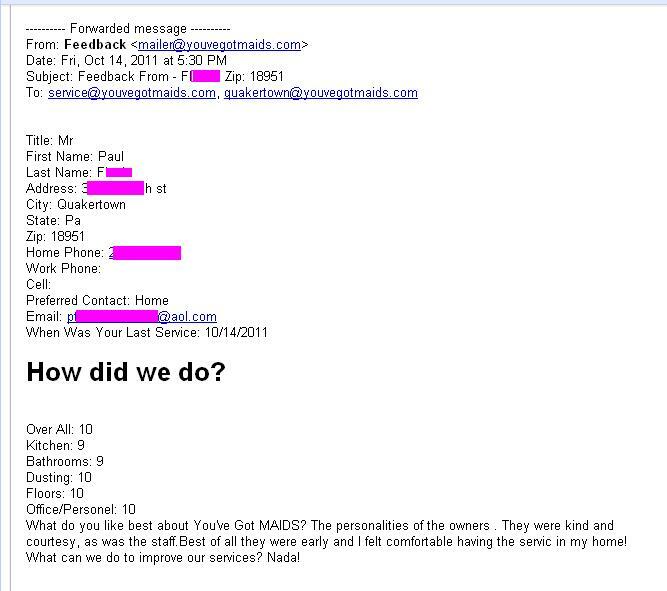 Perkasie Maid Service Feedback | Smells Amazing!